Hello everyone! It has been a long time since my last update….since I last baked…..it was a busy year…..
Our 30th bake from The Home Bakers. 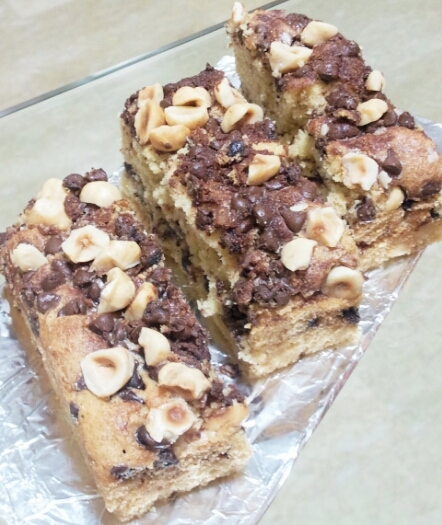 THB is a baking club organised by Joyce of Kitchen Flavours, and we are baking the recipes in ‘Coffee Cakes’ by Lou Seibert Pappas. This is my 2nd time hosting this event, and I’ve selected Milk Chocolate Walnut this time round. Very simple and easy to make recipe which takes less than an hour to complete. Awesome cake! A great start for me as I usher in the Year of Horse. Preheat the oven to 350 degrees F. Lightly butter and flour a 9-inch springform pan. In a large bowl, cream the butter and sugars (reserve the 3 tablespoons granulated sugar) together with a wooden spoon or an electric mixer and beat in the eggs and vanilla until smooth. In a medium bowl, combine the flour, baking powder, baking soda, and salt and stir to blend. Stir the dry ingredients into the creamed mixture alternately with the buttermilk or yogurt in 2 increments and beat until the batter is smooth. Stir together the 3 tablespoons sugar and the cinnamon. Spread half the batter in the prepared pan and sprinkle with half the cinnamon sugar and half the chopped chocolate or wafers. Spread the remaining batter evenly over the top and sprinkle with the remaining cinnamon sugar and chocolate and the nuts. Bake for 25 to 30 minutes, or until the cake is golden brown and a cake tester inserted in the center comes out clean. Transfer to a wire rack and let cool for 10 minutes. Remove the sides of the pan. Serve the cake warm or at room temperature, cut into wedges. 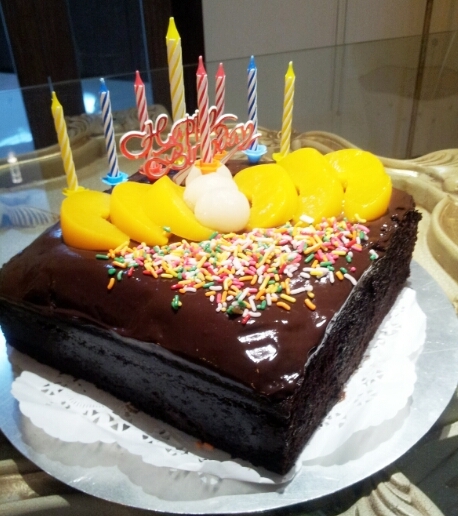 Do check out all the bakes on this cake by other awesome home bakers here. I almost ended up buying a cake off the shelf for my son’s birthday. Re is 17 today. Happy Birthday, my dear! 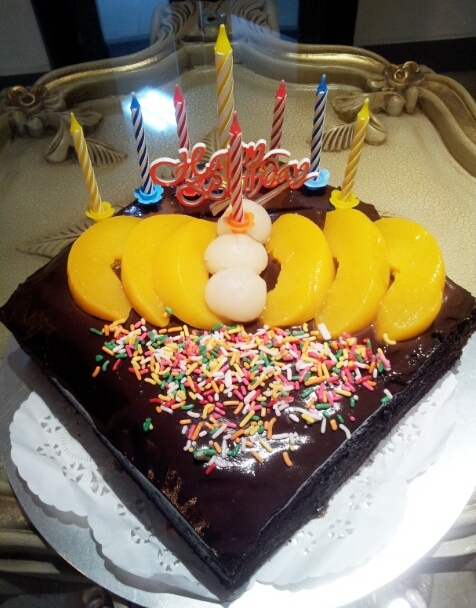 Whipped up this last-minute cake with a simple ganache for him. Source : Must try chocolate cupcake from my previous attempt (here) adapted from Anncoo Journal. This recipe has been doubled to make a 9″ square cake. Chocolate ganache from Joy of Baking. 1. Grease and line the bottom of a 9″ square pan. Preheat oven at 160 degrees C.
2. Sift flour, salt, baking powder and cocoa powder in bowl. Dissolve baking soda in milk. 3. Cream butter and sugar until light. Add essence and eggs, continue beating. 4. Add in the rest of the ingredients (milk, coffee liquid and flour ingredients), beat till smooth. 5. Pour batter into a 9″ square pan. Bake in a preheated oven at 160C for about 50-55 mins or until skewer inserted into the center of the cake comes out clean. 6. Leave to cool on rack before decorating. 7. Prepare chocolate ganache and pour over the cake. Decorate as desired. Chocolate Ganache : 227g semisweet or bittersweet chocolate, cut into small pieces, 180ml heavy whipping cream, 28g butter and 1tbsp brandy/rum. Place the chopped chocolate in a heatproof bowl. Set aside. Heat the cream and butter in a small saucepan over medium heat. ( Can also heat the cream and butter in the microwave.) Bring just to a boil. Immediately pour the boiling cream over the chocolate and allow to stand, without stirring, for a few minutes. Stir gently ( as you do not want to incorporate air into the ganache) with a whisk until smooth. Add in liqueur (optional). I’m in immense pleasure to host THB #17 bake in my blog. Joyce from Kitchen Flavours is the founder of The Home Bakers. Currently we are baking the recipes in ‘Coffee Cakes’ by Lou Seibert Pappas and we welcome you to join in the fun to bake along if you own a copy of the book. You may contact Joyce at kitchenflavours@yahoo.com for more details. Members of The Home Bakers will take turn to select a recipe and be the host of the chosen recipe. 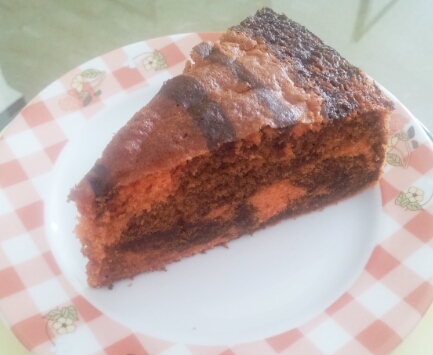 I shortlisted a few recipes from the book to read in details, and finally decided on Essence of Orange Chcocolate Wafer Cake as the use of whole orange has whetted my appetitte. Something unusual, it’s the whole orange minus the seeds pulverized with raisins in a food processor and it looks like a sticky paste. Just to sidetrack a little. Amazingly, my blog has reached its second year on April 11. I would like to thank you, my friends, readers and followers for the support throughout my blogging journey. Coming back to the cake. This Orange Chocolate Cake is moist and the sweetness balances well with the orange and chocolate chips. The raisins which have been pulverized with the orange give it a nice crunch though they are no where to be seen. 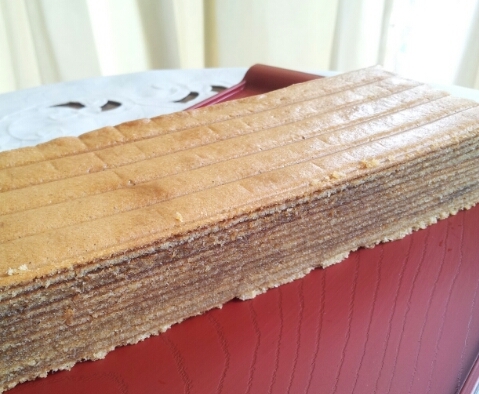 The texture of the cake is soft and dense. Preheat the oven to 350°F. Butter and flour a 10-inch springform pan or 9-inch square pan. Remove a thin slice from the stem end of the orange and cut the fruit into eighths, leaving the peel on. In a food processor, combine the orange segments and raisins and process until finely ground. In a large bowl, cream the butter and sugar with a wooden spoon or an electric mixer until light and fluffy. Add the eggs, one at a time, beating well. Mix in the orange mixture. In a medium bowl, combine the flour, baking powder, baking soda, and salt. Stir to blend. Add the dry ingredients to the creamed mixture alternately with the yogurt or buttermilk in 2 increments, beating until blended. Reserve 1/4 cup of the chocolate for the topping and mix the remainder into the batter. Spread evenly in the prepared pan. Sprinkle the reserved chocolate evenly over the top. Bake for 35 to 40 minutes, or until the cake is golden brown and a cake tester inserted in the center comes out clean. Let cool in the pan on a wire rack for 15 minutes, then remove the pan sides. Serve slightly warm or at room temperature, cut into wedges. 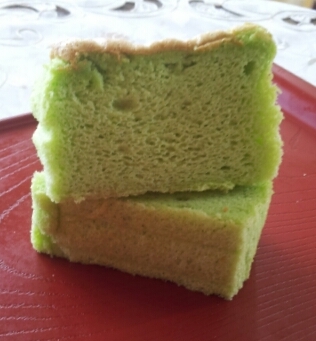 Continuing the strawberry powder episode, here’s another attempt tweaked from Pandan Ogura Cake to Strawberry flavour. 1. Preheat oven to 170 degrees C.
2. Grease the bottom of a 8″ square tin and line with baking sheet. 4. Remove mixture into a large mixing bowl. Sift in (B) and mix well. Cover wit cling wrap and set aside. 5. In a mixer, whisk whites with tartar till foamy. Slowly add in sugar a little at a time, and whisk to stiff peak. 6. Mix 1/3 of the egg whites to egg yolk mixture. Then, fold in the remaining egg white. 7. Pour batter into cake tin and bake for 40-45 mins or until cooked. 8. 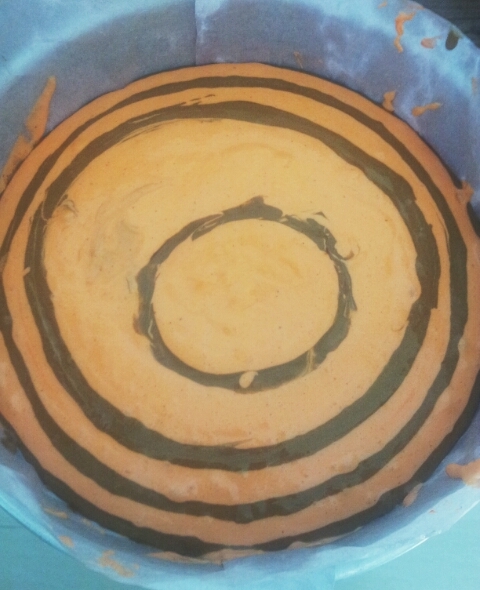 Invert cake and let it cool. Wishing all chinese readers 元宵节快乐! With Zebra Cake recipe that I made long ago, I tweaked a little by changing the vanilla layer to strawberry as I wanted to try out the strawberry powder I won from Cathy Joy’s giveaway. 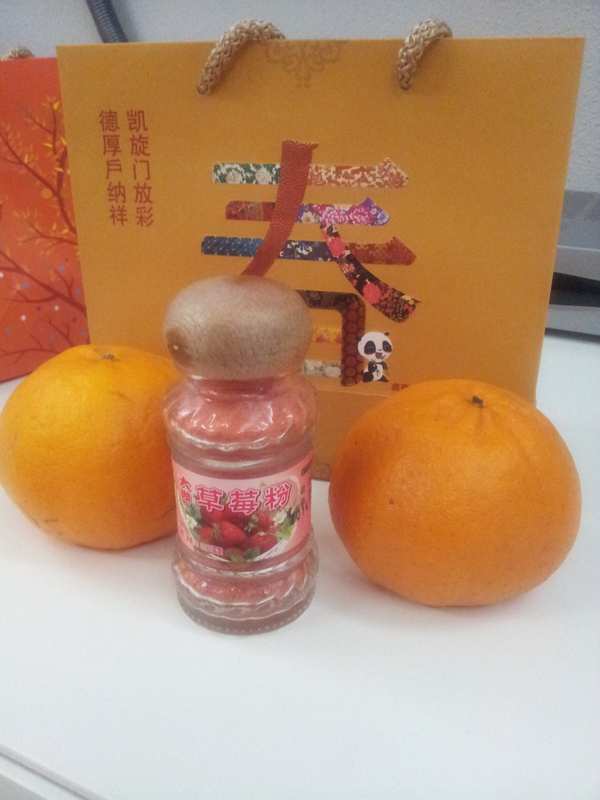 It was so thoughtful of Cathy to pass the bottle of strawberry powder she bought from Taiwan before CNY. Thanks Cathy! Cathy has a wonderful blog, I like all of her bakes especially the patterned swiss rolls she featured in her blog. Pls drop-by her blog to peep all her lovely bakes. 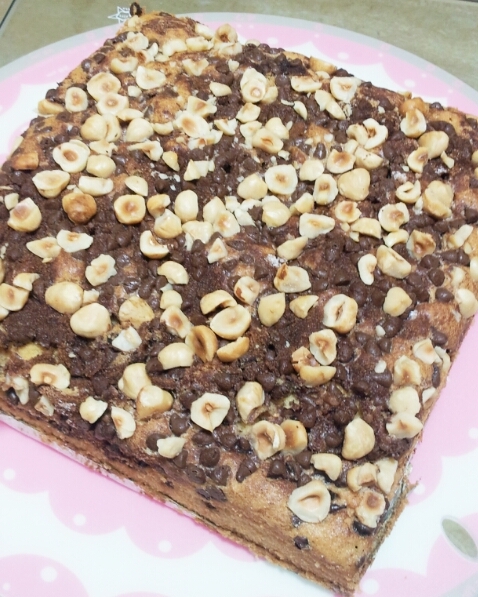 I can’t name this post ‘Zebra’ as both the chocolate and strawberry mixture was jumbled up, and since it has more of a marble effect, I shall rename this as Strawberry Chocolate Marble Cake. This recipe used mainly egg whites which I cleared quite a lot of my whites stocks in the fridge. This cake texture was soft and crumbly. 1. Line and grease 9″ round cake tin. Preheat oven to 170 degrees C.
2. Whisk (A) on high speed until thick and fluffy. Fold in (B) and mix well. Take out 1/3 of the batter and fold in (C). 3. Fold in (D) to the remaining batter. 4. Scoop 2 tbsp of strawberry batter into the center of the tin. Top with 1 tbsp chocolate batter. Do not level the batter. Repeat until batter is finished. 5. Bake for 40-45 minutes or until cooked. 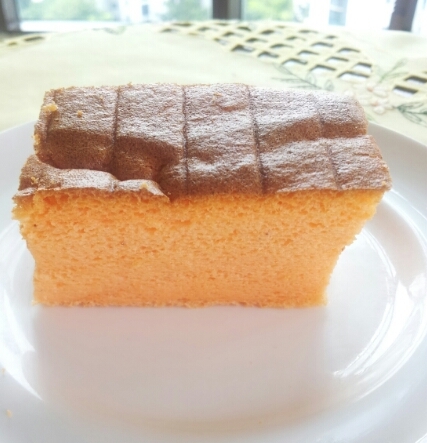 Kek Lapis is known for its high proportion of egg yolks and butter, you can find recipes using 20-15-10 egg yolks and so I shortlisted to this slightly ‘healthier’ version that uses 15 egg yolks, 1-1/2 tbsp condensed milk and 450g butter. 3. Beat (A) till fluffy, add in beaten (B) from step 2 and mix well. Slowly mix in (C). 4. Whisk (D) till stiff. 5. Fold in (D) into step 3. 6. Greased and lined a 9″ square tin. 7. Heat up the empty tin in the preheated oven for 3 mins. 8. Weigh 130g batter and spread evenly onto the baking tin. Bake till golden brown. 9. Remove tin from oven, switch oven to grill mode with 220 degrees C (upper heat only). 10. Prick, press and brush with a little melted butter on the cake layer. 13. Remove and leave to cool. While baking layer by layer, prick only when there are air bubbles rising up and press down with any flat-bottom glass. This is to ensure all layers are flat and nice. The purpose of brushing a little melted butter over baked layer is to keep the cake moist. 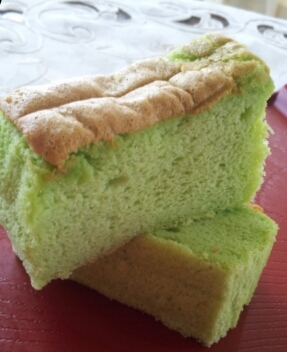 A popular cake among the Malaysian Chinese bloggers, and being a follower of some of these bloggers I simply cannot resist jumping on the Ogura bandwagon even though I do not know what does the original 相思蛋糕 (ogura cake) taste like. 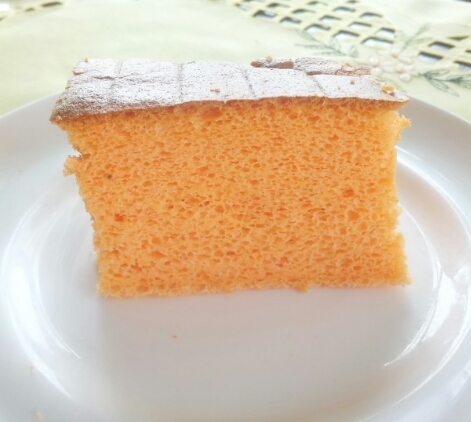 The original version comes with cream sandwiched in between two slices of cake, but I chose to have it plain because my cake was too soft and I don’t think I will get a nice cut. 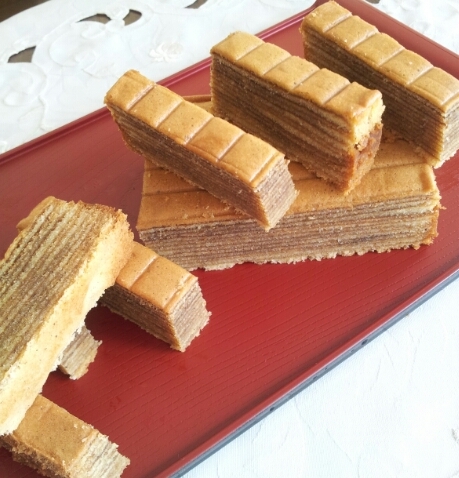 The taste of 相思蛋糕 (ogura cake) is quite close to chiffon except that it is dense, soft and cottony. 3. Beat A until frothy. 4. Sift in B and mix well. Cover with cling wrap and set aside. 5. In a mixer, whisk egg whites until frothy. Add in cream of tartar. Gradually add in sugar in 3 additions and whisk until stiff peak forms. 6. Gently fold in 1/3 of the beaten egg whites into egg yolks mixture, then fold in the remaining beaten egg whites. 7. Pour batter into the prepared pan and bake for 45 minutes. 8. Invert the cake on a wire rack to cool.